On December 7, 2010, our company recorded one of our highest registration days ever. Why? Because it was the launch date of the Chrome Web Store, and Lucidchart was lucky enough to be one of the featured applications. Fast forward nearly two years, and Lucidchart remains one of the top 10 most popular productivity apps and is the most installed application integrated with Google Drive. We just passed the half-million mark for installations, and it seemed like the right time to share some of the lessons we've learned about success in the Chrome Web Store. An early criticism of the Chrome Web Store is that it was essentially a collection of glorified bookmarks. There was a lot of truth to this argument because most applications (including Lucidchart at launch) simply added a bookmark to your New Tab page in Chrome. Not particularly innovative. We were acutely aware of this criticism, and as a result, we jumped at the opportunity to integrate Lucidchart with Google Drive earlier this year. This was our chance to transcend bare-bones functionality in favor of greater convenience and accessibility. Creating, editing, and sharing documents within Google Drive (formerly Google Docs) were features that our users had requested for years and we were thrilled to deliver them. Even better, we’re the only web-based application that can handle those pesky Microsoft Visio files (.vsd and .vdx) from Drive. When Google Drive launched on April 24, it showcased Lucidchart, along with several other apps, as a featured launch partner. We again saw record installs and registrations, and even when the initial surge had passed, we were averaging more than double the number of installs as a result of the Google Drive integration. It's surprising, then, that we're six months out from the Google Drive launch and less than 100 apps--out of tens of thousands--are integrated with Drive. Of course that’s not the only way to add value above being just a bookmark but it’s one of the most striking examples. If all you’re offering users is another way to bookmark your app, you’re selling yourself short, as well as your users. The Chrome Web Store is now available in 42 countries and 54 languages. While the expansion to more countries and languages was occurring, we decided to experiment with translating our Chrome Web Store listing. The results were impressive. 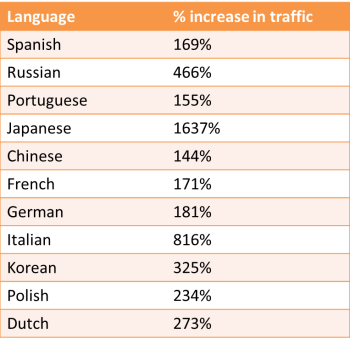 The data below represents the increase in traffic from visitors for a representative selection of languages after the translated listing was live for about one month. The data has been normalized to represent only the growth attributable to the translation. Translate your listing into languages that correspond with your target market to reach a broader group of non-English speakers. However, there’s a caveat to this lesson. Because Lucidchart is a very graphical application that generally requires minimal text and menus, we didn't have to localize our entire application to provide a good experience for our non-English speakers. If yours is a text-heavy application, this approach could backfire if these users decide to give you a one-star rating since they can’t effectively use the application. So apply this lesson with caution. Over the last couple of years, Lucidchart has donated more than one million licenses to accredited educational institutions around the world. We are passionate about education and educators are passionate about Lucidchart. So when Google approached us about being one of the apps in the Google Chrome Education App Pack, it was a natural fit. The result is that we now have two listings in the Chrome Web Store: one in Productivity targeting professionals and one in Education targeting educators and students. With separate listings, it’s much easier to message and market effectively to these distinct audiences. In the last 4 months, we've had ~17,000 installs from our Lucidchart for Education listing. While significantly smaller than our Productivity channel, it has nevertheless been a great way to pick up additional users. Now, to be clear, we are not advocating multiple listings that add no real value. Not only could these be marked as spam, but you also risk cannibalizing the installs on your primary listing. In our case, the education listing was distinct in both presentation and functionality. When an educator or student installs the app using an educational email address, they are automatically provided the free educational upgrade. In addition, administrators are provided additional controls and users are provided many educational templates that are not customarily shown by default in the standard product. Target different audiences with multiple listings and customized functionality. There’s no doubt that being featured at the launch of the Chrome Web Store and at the launch of Google Drive provided significant momentum for our application. But we’re referring here to the ongoing features that happen every day in the Chrome Web Store. It’s no surprise that being featured in the home page slider is the Holy Grail for any web application. We know because recently, Lucidchart was lucky enough to be featured for 7 days in a row, next to Cut the Rope. 2) Momentum Yes, it’s the old chicken and egg problem. Lots of installs gets you featured, but being featured gets you lots of installs. Here at Lucidchart, we've used our home page, email newsletters, account notifications, social media channels, and other platforms to drive existing users to install Lucidchart from the Chrome Web Store to help create and maintain that momentum. Leverage existing goodwill and add to it by continually providing value for your customers. Hustle until you land in the featured queue. So there you have it: a few key lessons from the Lucidchart team on how to take an app to success in the Chrome Web Store. What lessons has your company learned along the way? Share below in the comments.